Vain debuted in 1989 with "No Respect" and their songs were frequently featured on MTV's Headbanger's Ball, they toured their asses off in the US and rounded the year off with a UK tour supporting Skid Row and things looked bright for them. In 1991 when they were about to really take off, things turned bad for them; ready with album number two, "All Those Strangers" they all of a sudden found themselves without a record label due to the collapse of Island Records. 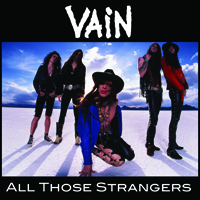 "All Those Strangers" show a young and up-coming Davy Vain and fit right in with all albums he has been a part of later on. This is close to a mandatory purchase if you like his work and/or if you still get a kick out of listening to those dinosaurs mentioned above every now and then. 10. Do You Sleep With Strangers?